Danone says it is in talks to sell its biscuit and cereal unit to the world's biggest biscuit maker, Kraft Foods, for 5.3bn euros ($7.2bn; £3.56bn). If talks progress then the French firm could make a sale in the last quarter of 2007, but any deal would exclude Danone's Latin America and Indian arms. The offer includes a pledge not to shut any French Danone biscuit manufacturing plant for three years after any deal. Danone's LU biscuits are a popular choice among French children. Kraft, one of the biggest food and drink firms in the world, has a biscuit division that includes Oreo cookies and Ritz crackers. 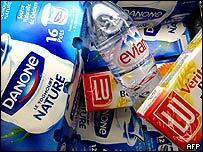 Shares in Danone had been suspended on the Paris stock market prior to the talks' announcement. After trading resumed, the French firm's shares ended the day up 1.25% to 61.71 euros. "This transaction will give the group an opportunity to focus... on the rapid expansion of its activities in two health-related areas: fresh dairy products and beverages based on source and mineral water," said Danone chairman Franck Riboud. The biscuit division represented about 16% of Danone's group sales last year, with the LU brand itself accounting for nearly half of the division's sales. The unit's like-for-like sales rose 3.1% last year, whereas Danone's dairy division saw a 9.2% rise in sales and its beverage division enjoyed a 14.8% increase. Analyst Guy Francheteau at brokers Fideuram Wargny said: "The timing of the deal seems right for getting the optimum price from Kraft." Other analysts have pointed out that Danone's healthy balance sheet does not require it to sell assets to expand. Takeover targets that may attract Danone include Russian consumer foods group Wimm-Bill-Dann in which Danone owns an 18.4% stake, as well as the remaining stake in its Chinese Wahaha beverages joint venture. Buying out its joint venture partner could bring a halt to the ongoing dispute with the founder of Wahaha, who Danone claims has illegally set up parallel operations not related to their agreement.